THE ICK FACTOR The lab of Stephen A. Kells, a University of Minnesota entomologist. 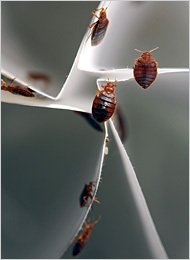 Bedbugs are not known to transmit disease. LITTLE RESEARCH Stephen A. Kells is one of the few specializing in bedbugs. Think of it, rather, as Cimex lectularius, international arthropod of mystery. In comparison to other insects that bite man, or even only walk across man’s food, nibble man’s crops or bite man’s farm animals, very little is known about the creature whose Latin name means — go figure — “bug of the bed.” Only a handful of entomologists specialize in it, and until recently it has been low on the government’s research agenda because it does not transmit disease. Most study grants come from the pesticide industry and ask only one question: What kills it? “The first time I saw one that wasn’t dated 1957 and mounted on a microscope slide was in 2001,” said Dini M. Miller, a Virginia Tech cockroach expert who has added bedbugs to her repertoire. The bugs have probably been biting our ancestors since they moved from trees to caves. The bugs are “nest parasites” that fed on bats and cave birds like swallows before man moved in. That makes their disease-free status even more baffling. (The bites itch, and can cause anaphylactic shock in rare cases, and dust containing feces and molted shells has triggered asthma attacks, but these are all allergic reactions, not disease.) Bats are sources of rabies, Ebola, SARS and Nipah virus. And other biting bugs are disease carriers — mosquitoes for malaria and West Nile, ticks for Lyme and babesiosis, lice for typhus, fleas for plague, tsetse flies for sleeping sickness, kissing bugs for Chagas. Even nonbiting bugs like houseflies and cockroaches transmit disease by carrying bacteria on their feet or in their feces or vomit. But not for lack of trying. South African researchers have fed them blood with the AIDS virus, but the virus died. They have shown that bugs can retain hepatitis B virus for weeks, but when they bite chimpanzees, the infection does not take. Brazilian researchers have come closest, getting bedbugs to transfer the Chagas parasite from a wild mouse to lab mice. “Someday, somebody may come along with a better experiment,” Dr. Goddard said. That lingering uncertainty has led to one change in lab practice. The classic bedbug strain that all newly caught bugs are compared against is a colony originally from Fort Dix, N.J., that a researcher kept alive for 30 years by letting it feed on him. Why the bugs disappeared for so long and exploded so fast after they reappeared is another question. The conventional answer — that DDT was banned — is inadequate. After all, mosquitoes, roaches and other insects rebounded long ago. Much has to do with the bugs’ habits. Before central heating arrived in the early 1900s, they died back in winter. People who frequently restuffed their mattresses or dismantled their beds to pour on boiling water — easier for those with servants — suffered less, said the bedbug historian Michael F. Potter of the University of Kentucky. Success finally arrived in the 1950s as the bugs were hit first with DDT and then with malathion, diazinon, lindane, chlordane and dichlorovos, as resistance to each developed. In those days, mattresses were sprayed, DDT dust was sprinkled into the sheets, nurseries were lined with DDT-impregnated wallpaper. In North America and Western Europe, “the slate was virtually wiped clean,” said Dr. Potter, who has surveyed pest-control experts in 43 countries. In South America, the Middle East and Africa, populations fell but never vanished. The bugs also persisted on domestic poultry farms and in a few human habitations. One theory is that domestic bedbugs surged after pest control companies stopped spraying for cockroaches in the 1980s and switched to poisoned baits, which bedbugs do not eat. But the prevailing theory is that new bugs were introduced from overseas, because the ones found in cities now are resistant to different insecticides from those used on poultry or cockroaches. Exactly where they came from is a mystery. Dr. Schal is now building a “world bedbug collection” and hopes to produce a global map of variations in their genes, which might answer the question. Experts say they’ve heard blame pinned on many foreign ethnic groups and on historic events from the fall of the Berlin Wall to the Persian Gulf war to the spread of mosquito nets in Africa. Every theory has holes, and many are simply racist. Pest-control companies say hotels, especially airport business hotels and resorts attracting foreign tourists, had the first outbreaks, said both Dr. Potter and Richard Cooper, a pest-control specialist. Whatever the source, the future is grim, experts agreed. Many pesticides don’t work, and some that do are banned — though whether people should fear the bug or the bug-killer more is open to debate. Treatment, including dismantling furniture and ripping up rugs, is expensive. Rather than actively hunting for bugs, hotels and landlords often deny having them. Some people overreact, even developing delusional parasitosis, the illusion that bugs are crawling on them. “People call me all the time, losing their minds, like it’s a curse from God,” Dr. Miller said. Well, he was asked — can you feel them bite? Why in the world, he was asked, would he ask kids to do that?